107. Human Resources Management: How To Keep Quality Employees (2/2) – How to Shape Human Behavior. 00:07:13 One of the most important things for Millennials are their peers. One of the best things companies can do to retain their employees is to let them become friends. The boss is also a very important facter with regards to whether an employee stays with your company. You could have the best company reputation which attracts all the best job candidates, but if the boss or the peers aren’t compatible, then your employees will leave; employees join companies, but leave bosses and peers. 00:13:28 Low involvement decisions are made with spontaneious, very minimal thinking involved; decisions such as which type of toothpaste, coffee, etc will I buy. High involvement decisions are made with intense thought and reasoning; decisions such as should I leave my current job for a new one? Should I change cities or apartment? 00:22:32 An exit interview is “a survey conducted with an individual who is separating from an organization or relationship such as with an employee, a student, or a member of an association” with the intention of understanding the motivations of why the person left to solve problems and avoid future turnover. 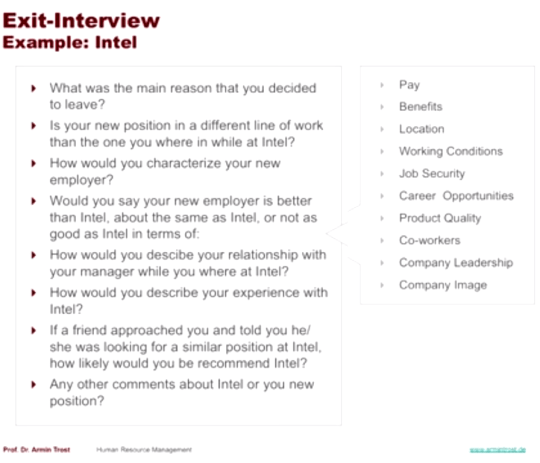 The problem with the exit interview process is there’s no guarantee of truthfulness in the person’s answers and subjectivity in the questions asked. 00:33:04 Recall in the lecture 103. Human Resources Management: How To Keep Quality Employees (½), the total turnover cost of employee retention can range from 100%-400% of that position’s salary, depending on how specialized the job is, and whether or not it is a key position. Companies therefore need to proactively tackle employee turnover to avoid losing all of their best employees. 00:38:21 Once you have identified Where the problem is, you can then begin resolving it, be it an incompetent boss, peer personality problems, company procedure issues, etc. Posted on May 25, 2015 January 17, 2017 by Joshua SMITHPosted in videosTagged Armin Trost, hochschule, human resources, Millennials, recruitment, startups, videos, youtube.